Stapleford Town Centre has a fantastic range of businesses and shopping facilities on offer, so why not give it a visit? Derby Road, Nottingham Road and Church Street are lined with a strong mix of different retailers including various independents and some well loved national chains. As well as its attractive businesses, Stapleford benefits from convenient access provided via public transport from both Nottingham and Derby City Centre’s and the M1 motorway, helping it link up with the rest of the country. Stapleford has both of long and short stay parking provision, as well as being served by the frequent i4 bus service from Trent Barton, which runs into the town centre in both directions every 10 minutes during the day, leaving from Nottingham City Centre and Sandiacre. Stapleford Town Centre is now accessible via the tram, which terminates at Toton Lane Station. The stop is less than 1 mile from the town centre and sees a tram arrive from the city and surrounding areas less than every 10 mins during the day. Stapleford has 4 Council owned public car parks, as well as further dedicated supermarket parking and spaces available (Sainsbury’s Local). Halls Road Car Park, NG9 7FP is FREE ALL DAY on Saturdays. There are no parking charges after 12.00noon Saturday in ALL Council car parks in Stapleford. 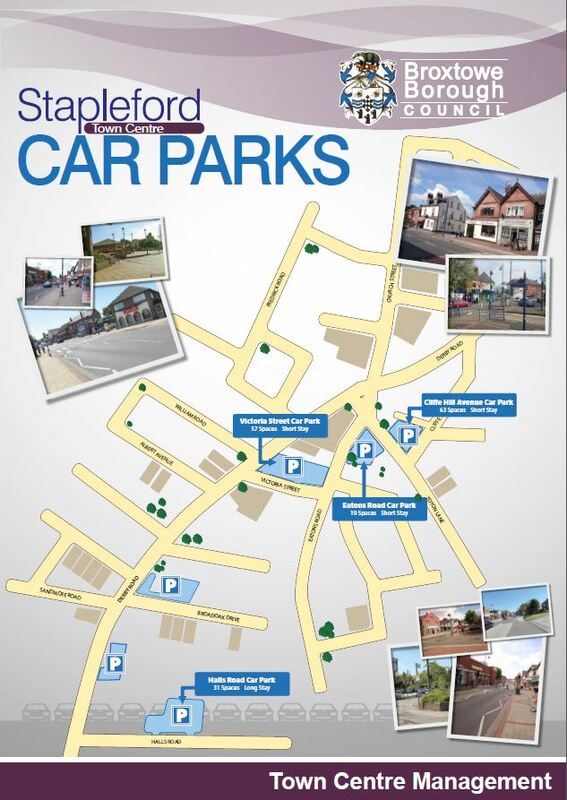 Below is a downloadable map with all the parking provision available in Stapleford Town Centre in PDF format.